We keep track of your donations and over the years they add up! 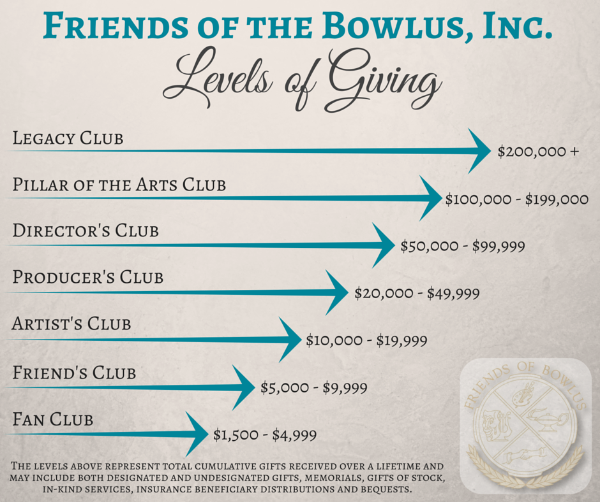 The listing below represents cumulative, lifetime donations received by the Friends of the Bowlus, Inc. since the organization's founding in 1991. Donations include both designated and undesignated gifts, memorial gifts, gifts of stock, and in-kind services. Donations also include gifts received upon death including bequests and insurance beneficiary distributions. Names separated by a semicolon represent a change in household during the years of giving. Mack V. & Sara C. Colt, Colt Investments, Inc. NOTE: The Friends bookkeepers have worked hard to keep track of the numerous donations received over the past 25+ years . . .and it's possible to have missed something as the record keeping systems have changed along the way. If you have any questions about this donor listing and why your family's name appears (or does not appear) in a particular category, please don't hesitate to notify the Bowlus office. We are happy to share the information that we do have on file -- and want to record our donor history as accurately as possible.